It's the end of January, and it feels like it has been a long winter so far. You wouldn't think it, because as I write this the temperature outside is well above freezing. The snow is melting and the streets are slushy. However, this was NOT the case for nearly the entire month of December, and at least the first ten days of January. During those cold snaps, I cooked a LOT of comfort food for my family. I prepared a lot of the usual suspects that we love (such as chili, slow cooked pasta sauces, and short ribs to name a few). I realize as I listed that I don't have any of them on my blog. They seem so ordinary because I make them so regularly that I never think to write about them. This post serves double duty today. 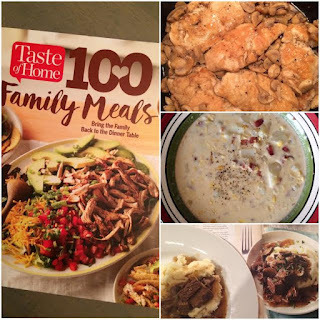 First, I want to share three recipes that scream cold weather comfort food to me. If there's one thing I know about living in Alberta, it's that it WILL get cold again, despite the fact that it's gorgeous out today. 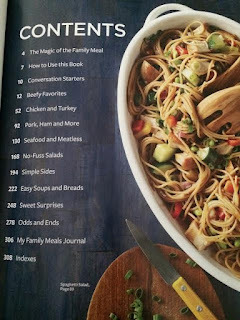 Each chapter has a meal planner section, which pairs suggested entrees, sides, and desserts, and contains a suggested grocery list. People are busy, and it's hard for some families to sit down and eat a complete meal together at the table. 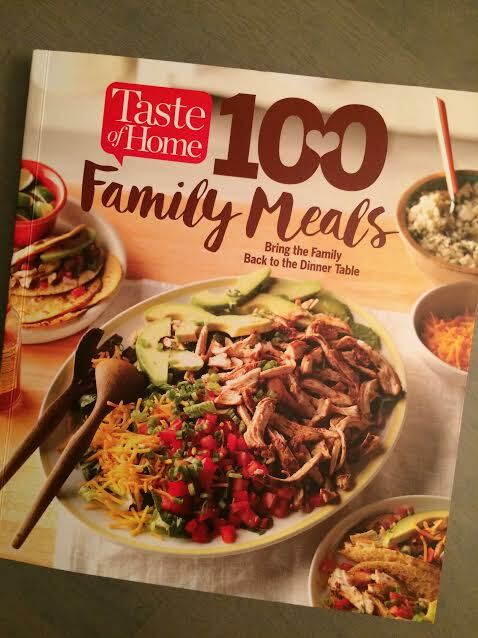 I cook a lot, so I'm lucky that my family will easily sit down to 100 family meals together each year. However, I realize that not everyone is in the same situation as us. This book takes the guesswork out of planning simple family dinners. This book is available via the Shop Taste of Home site, however, if you live in Canada, you are out of luck there, as it doesn't provide shipping here. However, I have seen it here in many major supermarkets, bookstores, and even pharmacies here. Also, many popular Canadian online retailers also offer this book at a price point below $25! Please check it out. Without any more rambling, here are three recipes that are perfectly delicious and comforting for a chilly winter evening :) I have included a link to the original recipe, as well. I've made my own notes in blue italics, below. Speedy Chicken Marsala - This recipe really is quick!. The sauce is super tasty, but mild enough for the kids. Both kids loved the fact that it's served with pasta. Noodles = success at our dinner table. 1. Cook pasta according to package directions. Pound chicken with a meat mallet to 1/4-in. thickness. In a large resealable plastic bag, mix the flour, lemon pepper and salt. Add chicken, one piece at a time; close bag and shake to coat. 2. In a large skillet, heat 1 tablespoon oil over medium heat. Add chicken; cook for 4-5 minutes on each side or until no longer pink. Remove from pan. 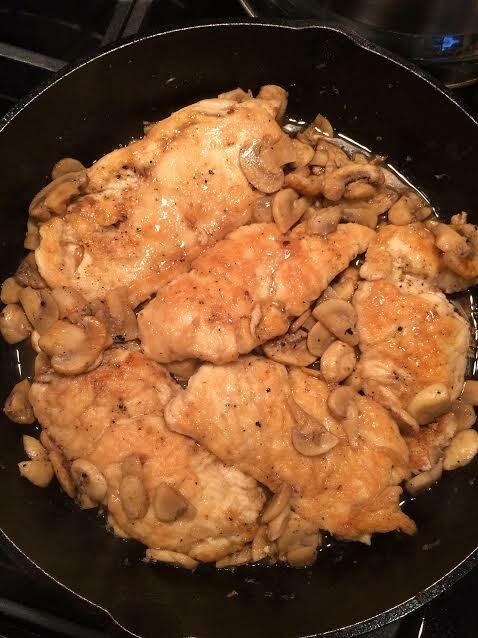 Use a cast iron skillet if you have one, because it helps brown the chicken beautifully. 3. In the same skillet, heat remaining oil over medium-high heat. Add mushrooms; cook and stir until tender. Add garlic; cook 1 minute longer. Add wine; bring to a boil. Cook for 5-6 minutes or until liquid is reduced by half, stirring to loosen browned bits from pan. Return chicken to pan, turning to coat with sauce; heat through. Some reviewers of this recipe suggested they wanted a bit more sauce. If you like extra sauce, I recommend adding 1/2 to 1 cup of chicken broth with the wine. 4. Drain pasta; serve with chicken mixture. Yield: 4 servings. 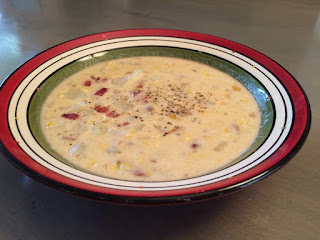 Bacon-Potato Corn Chowder - Again, everyone, including the littlest picky-eater, liked this soup. 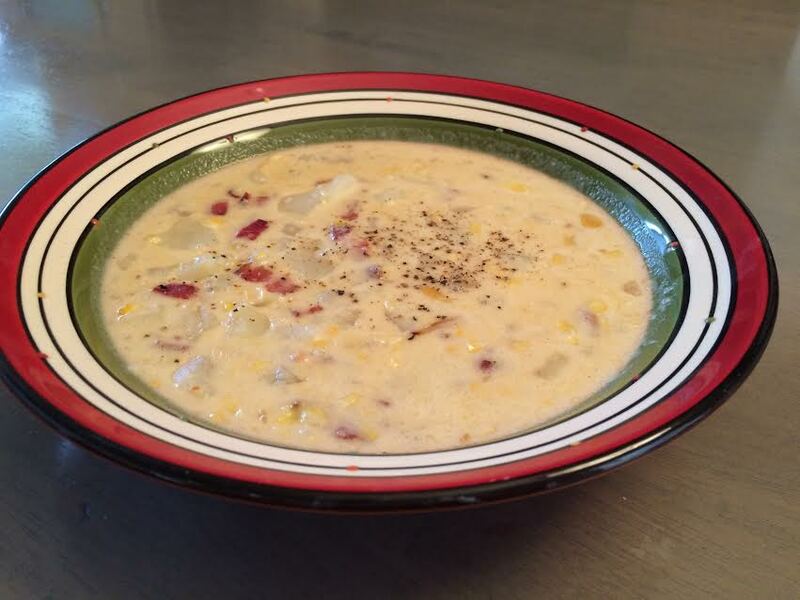 Bacon, potatoes and cream-style corn make for a super comforting soup, perfect for cold evenings. I served ours with freshly baked bread. 1. In a large skillet, cook bacon over medium heat until crisp, stirring occasionally. Remove with a slotted spoon; drain on paper towels. Discard drippings, reserving 1-1/2 teaspoons in pan. Add onion to drippings; cook and stir over medium-high heat until tender. 2. Meanwhile, place potatoes in a large saucepan; add water to cover. Bring to a boil over high heat. Reduce heat to medium; cook, uncovered, 10-15 minutes or until tender. Drain, reserving 1 cup potato water. At this point, I took a potato masher and squished up the potatoes just a little bit so that it was a mixture of chunky cubes, and half mashed potatoes. It helped to thicken up the chowder a bit too. 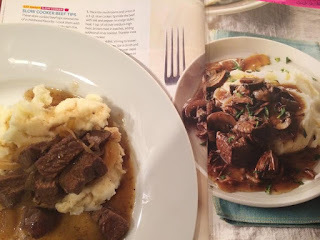 Slow Cooker Beef Tips Nothing says comfort food to me like the slow cooker. This beef melts in your mouth, and a bed of mashed potatoes soaks up all the rich gravy. 1 beef top sirloin steak (1 pound), cubed I used chuck because I prefer to use tougher cuts for slow cooking, and save the sirloin for the grill! 1. Place mushrooms and onion in a 3-qt. slow cooker. Sprinkle beef with salt and pepper. In a large skillet (I use cast iron because you cannot beat the nice browning that a hot cast-iron pan can provide), heat 1 teaspoon oil over medium-high heat; brown meat in batches, adding additional oil as needed. Transfer meat to slow cooker. 2, Add wine to skillet, stirring to loosen browned bits from pan. Stir in broth and Worcestershire sauce; pour over meat. Cook, covered, on low 6-8 hours or until meat is tender. 3. In a small bowl, mix cornstarch and cold water until smooth; gradually stir into slow cooker. Cook, covered, on high 15-30 minutes or until gravy is thickened. Serve with mashed potatoes. Yield: 4 servings.